Salisbury, MD – Parking locations and a free shuttle service have been announced for festival goers wishing to drive to the 78th National Folk Festival taking place over the weekend of September 7- 9, 2018, in downtown Salisbury. Presented FREE to the public, the Festival is a national showcase for America’s finest traditional artists, and will feature over 350 artists—musicians, dancers, craftspeople, storytellers, and other tradition bearers—with more than 35 different groups performing on the Festival’s seven stages. The National Folk Festival has partnered with Shore Transit to provide free shuttle service to the Festival’s satellite parking lots located at the Wicomico Youth & Civic Center, Wicomico County Stadium, and on the parking grounds of the former Salisbury mall. Shuttles will pick-up festival goers every 10 minutes and will run in 30-minute cycles. 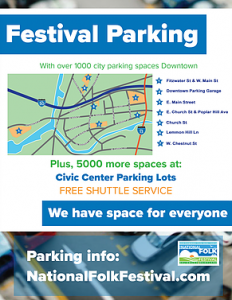 To learn more about festival parking, please visit https://www.nationalfolkfestival.com/.